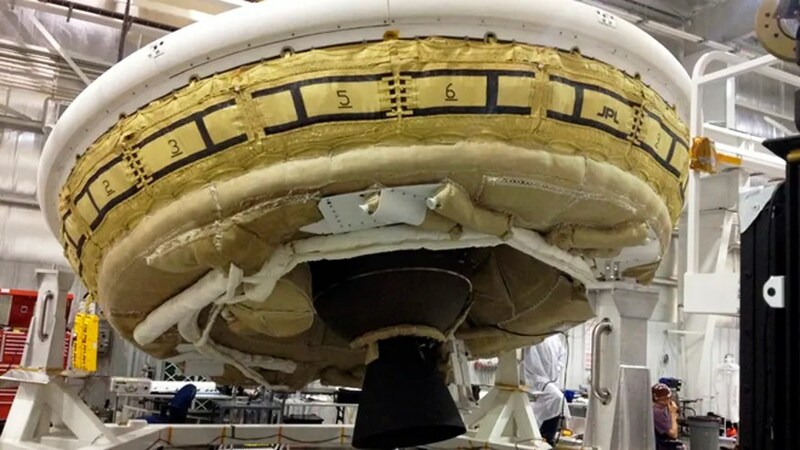 After several weather delays, NASA on Saturday launched a helium balloon carrying a saucer-shaped vehicle high in Earth’s atmosphere to test technology that could be used to land on Mars. The craft deployed a novel inflatable braking system on its way back to Earth, but its massive parachute failed to fully unfurl as it descended to a splashdown. Control room cheers that greeted successful steps in the complex test rapidly died as the parachute appeared to emerge tangled. “Please inform the recovery director we have bad chute,” a mission official ordered. The $150 million experimental flight tests a novel vehicle and a giant parachute designed to deliver heavier spacecraft and eventually astronauts. After taking off at 11:40 a.m. from the Pacific Missile Range Facility on the Hawaiian island of Kauai, the balloon boosted the disc-shaped vehicle over the Pacific. Its rocket motor should then ignite, carrying the vehicle to 34 miles high at supersonic speeds. The environment this high up is similar to the thin Martian atmosphere. As the vehicle prepared to drop back the Earth, a tube around it expanded like a Hawaiian puffer fish, creating atmospheric drag to dramatically slow it down from Mach 4, or four times the speed of sound. Then the parachute if only partially — and the vehicle splashed down about three hours later. At 110 feet in diameter, the parachute is twice as big as the one that carried the 1-ton Curiosity rover through the Martian atmosphere in 2011. Despite the parachute problem, “what we just saw was a really good test,” said NASA engineer Dan Coatta with the Jet Propulsion Laboratory in Pasadena, California. The test was postponed six previous times because of high winds. Winds need to be calm so that the balloon doesn’t stray into no-fly zones. Engineers planned to analyze the data and conduct several more flights next year before deciding whether to fly the vehicle and parachute on a future Mars mission. “We want to test them here where it’s cheaper before we send it to Mars to make sure that it’s going to work there,” project manager Mark Adler of the NASA Jet Propulsion Laboratory said during a pre-launch news conference in Kauai in early June. The technology envelope needs to be pushed or else humanity won’t be able to fly beyond the International Space Station in low-Earth orbit, said Michael Gazarik, head of space technology at NASA headquarters. Technology development “is the surest path to Mars,” Gazarik said at the briefing. The Los Angeles Times reported that teams working on the project will report at different times. These teams include specialists who will launch the balloon and communication teams. There are antennas near the base, the report said. There is a lot that can go wrong, but that’s precisely why the teams say these tests are imperative.